– Issues connecting to SkyCiv server. – Check you are connected to the internet by visiting another website. 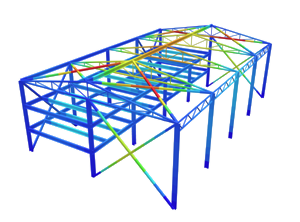 – Insufficient supports or fixities within supports – Add more supports and see if the structure solves. If it does, it is possible there are not enough supports to constrain the model, and it is not static. 113 Structure is not constrained – The structure is compeltely unrestrained in some translational direction (X, Y or Z) – Change a support to all Fixed (FFFFFF) and see if the structure solves. – Check for any disconnected nodes, elements or plates. Inspect to ensure your entire model is connected by nodes. – If cables exist in the model: Try these cable tips to get your model to solve.